Double exhibition ‘Meeting at the Building’ at KADK, School of Architecture, Copenhagen and ‘Ingredients & Cakes’ at the office of Leth & Gori. The passion for architecture and people is present in the two Copenhagen exhibitions by Eva Prats and Ricardo Flores. 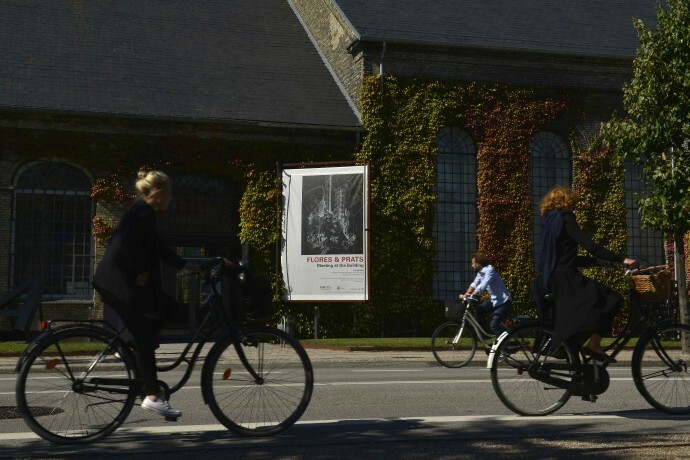 The scenes are the small gallery at the office of architects Leth & Gori, in Absalonsgade 21B Vesterbro, and the big and historic smithy at Holmen were the KADK -The Royal Danish Academy of Fine Arts, Schools of Architecture, Design and Conservation- is located. This project started with a collaboration between KADK studio and research departments and the architecture practice of Flores & Prats. 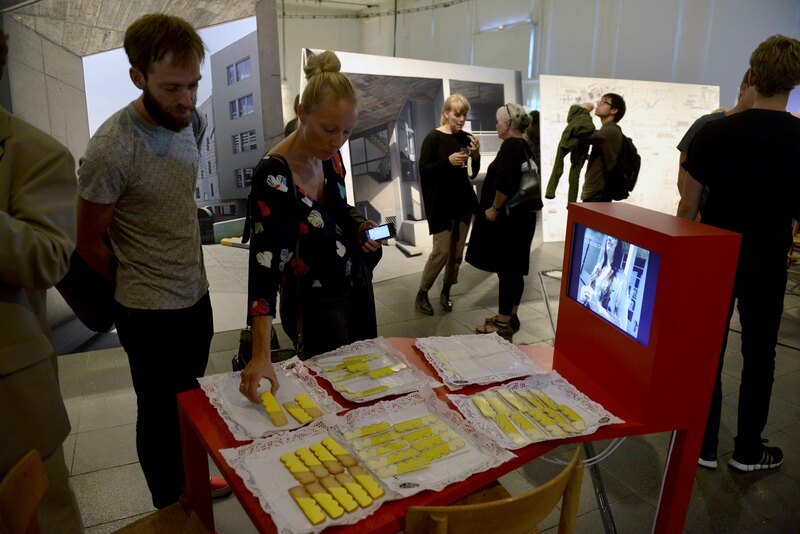 The students reflected on “The Social Dimension of Housing” with workshops and mutual visits both in Copenhagen and Barcelona. 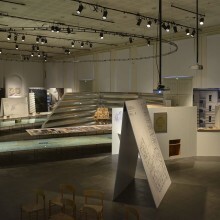 The result of this collaboration is two unique exhibitions not to be missed if you are interested in architecture as a framework for the meeting between people. 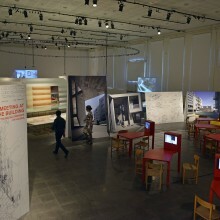 Ricardo Flores and Eva Prats belonged both to the core of the late Enric Miralles and later EMBT studio. In the case of Eva Prats the collaboration dates back to the early days of Enric Miralles and Carme Pinos were E. Prats started as a student of EM in 1986. In 1998 the Flores & Prats studio was founded following E. Prats winning of the Europan competition, Spain 1993. 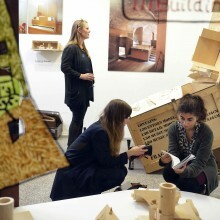 ’Ingredients & Cakes’ exhibits four projects in open suitcases. These suitcases have been packed back home in Barcelona and unpacked in Copenhagen reviling a rich atmosphere which fills the tiny space of the gallery run by the young architects Leth & Gori. One is immediately stroke by the kind of passion and carefulness only possible after thousands of hours at the architects drawing table. For many architects in Denmark, this exhibition is somehow related to the strong architectural environment of the late 80´ and early 90´s Barcelona (E. Miralles, C. Pinos, Lapeña & Torres, J. Llinas, E. Bru, V. Rahola, Garces & Soria, C. Ferrater, JL. Mateo, etcetera), opening a window to a hecho a mano era and tradition. 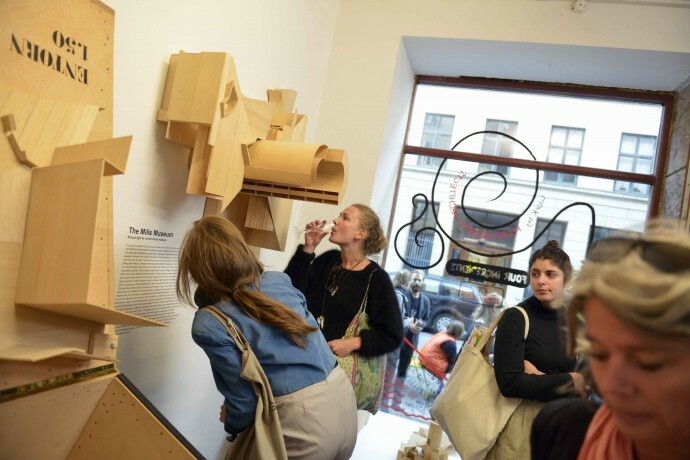 From this strong background, they bring beautifully crafted wooden models and handmade working drawings that leave no doubt about their strong intentions and capacity as architects. The building with 111 apartments is situated in Terrassa, north of Barcelona. The site is part of a master plan by the architect and town planner Manuel de Solà-Morales. He had been leading the process in dialogue with the individual plots and architects in charge of transforming the planning guides into housing and free spaces. Special emphasis has been placed on integrating the qualities of the surrounding landscape and topography into the individual housing units. Qualities that Flores & Prats enhance in the orientation and design of their 111 housing community! 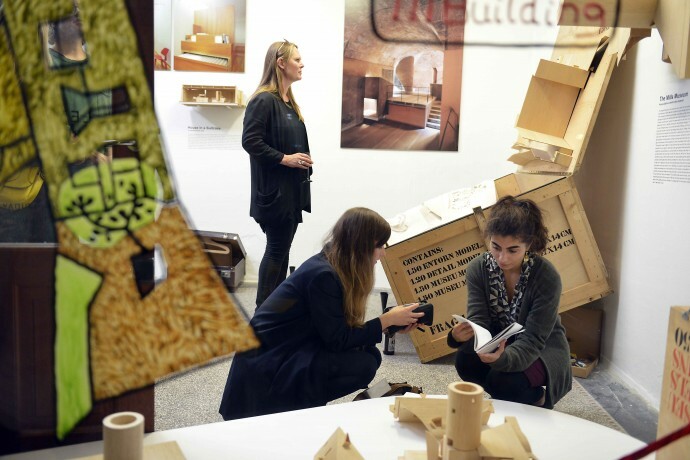 The project explores and experiments with the idea of promoting relationships and community in contrast to a tendency of isolation and insecurity that threatens social housing today. This is reflected in the lay-out with apartments spanning from façade to façade. Its organization places the bedrooms along the building’s perimeter while open kitchens and living rooms help to activate the balconies placed towards the hearth of the community: the central courtyard. The life inside and around the central courtyard is choreographed with sensitivity towards sociability, security and local climate. 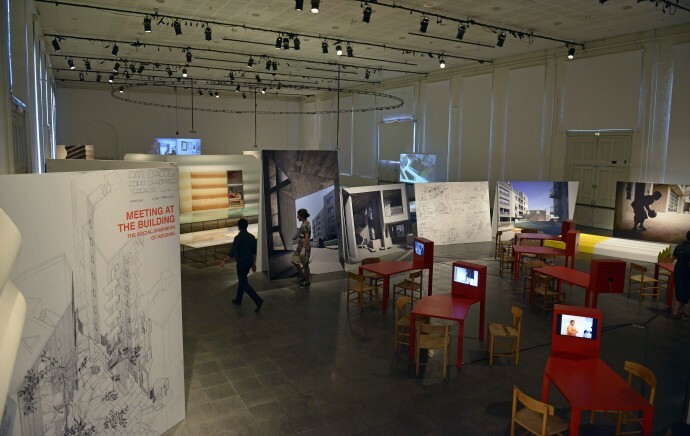 In the exhibition, we get an insight into how Flores & Prats arrive at the final design of the courtyard using studies of Plaça Sant Felip Neri in Barcelona’s Gothic centre as a guide to the history and culture of compact city structures. Within the strict economic framework that governs social housing, priority has been given to make the central courtyard a shared and stimulating experience. Yet something else and unexpected is essential to the experience of this building. A deep research of Renaissance palaces with rusticated stone facades in Firenze has inspired them to develop a very specific concrete casting. The formwork gives the finished façade a body-like scale, in contrast to the surrounding pine trees along the dry riverbed. An Instinctive idea with a strong artistic nerve that somehow should have exceeded the price of social housing? 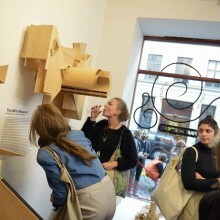 The exhibition on 111 Building is divided into 6 themes ; ‘Community Space’, ‘A promenade of 100 meters of working material’, ‘Barcelona-Copenhagen Workshop’, ’4 Films’, ‘Construction of the facades’ and ‘Private Space’. 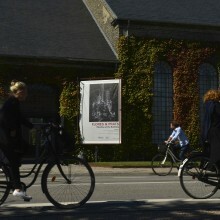 It is a very beautiful and important exhibition. The fact that Flores & Prats conceives to set the stage with this sole project is no less than impressive. This is due to the high quality of their work and because the exhibition is curated with a strong and clear narrative of the visionary ideas behind it. 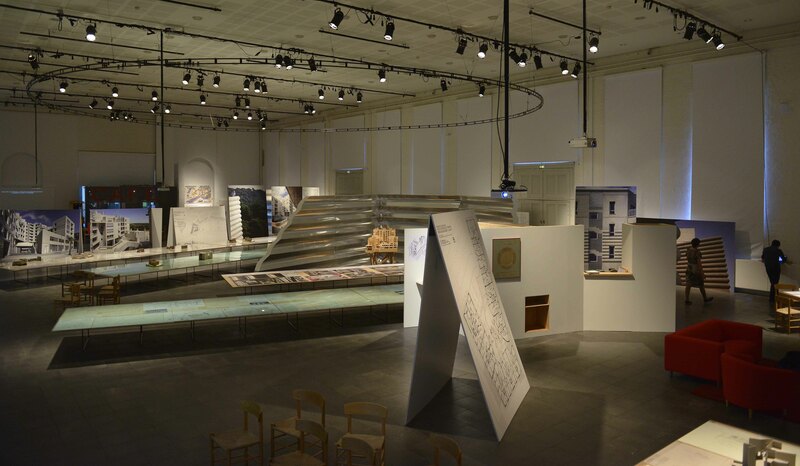 The polystyrene formwork is “reused” as space dividers in the exhibition at KADK where sketches, models, working drawings, large photographs and 1:1 mock-up from the housing units, all together forms an appealing aesthetic whole. We get very close to a studio and work in progress by Flores & Prats. They show the way forward for the new students that have arrived to our school this Fall starting their education as architects. Flores & Prats has not given up the idea of the omnipotent architect; artist and master builder!